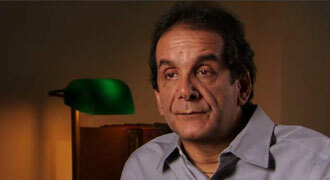 A syndicated columnist for the Washington Post, Charles Krauthammer is a regular essayist for Time magazine and a contributing editor to The Weekly Standard and The New Republic. He suffers from a spinal cord injury and has written about his own ethical concerns about pursuing embryonic stem cell research without enacting some limits. At what price a cure? Beware the "commodification of the embryo"
Going back to August 2001, tell me, what was your assessment of [President Bush's] speech [about limiting embryonic stem cell research]. It was one of the most fair-minded presidential addresses I think one has ever heard. The reason is, generally a president will build up his case by subtly or unsubtly denigrating the other side as he builds it. And here the president presented the two sides of the argument about stem cells in a very even-handed, very respectful way to what turned out to be the opposition, so much so that by three-quarters of the way into the speech, I'm watching, and I honestly did not know which way he would come out. And I was actually somewhat surprised by the line he drew, but it showed that he was serious about understanding the possible scientific benefits and respecting those who would essentially cross almost any ethical line in order to get there -- and for good reason, the good that might be at the other end. And yet [he made] the argument that there were certain ethical lines that should not be crossed. So I thought it was a great example of a moral argument made by a president in public in a way that is rarely ever made. ... In your experience as someone who's been in [Washington] a long time, how unusual is [it] for that degree of subtlety or nuance to be advanced? There are more spotted owls than there are speeches like that. And I was once -- in my youth, for my sins -- a speechwriter. I never wrote a speech like that, where you give the opposition its due. And that's because [President Bush] was not coming at this polemically. He really was wrestling with a difficult issue. He thought about it. He's not a man steeped in this argument, but he did give it serious thought, and he wanted to be respectful to both sides. I think the way he's been savaged over the years over this is really unfair, because I do think he came to this with [an] open mind and good will and tried to present a case for either side, in the end coming out for the moral lines, even at the cost of the good it might do, which is a difficult position to be in. It would seem that ... [in] some of his statements since, that he's become less nuanced in his views on [the embryonic stem cell issue]. Do you think that's fair? Well, I think the debate became very polarized, and I do blame it on the Democrats. If you look at the way they [used] the issue in the '04 [presidential] campaign and basically have portrayed the administration as anti-science -- the president as theologically obscure, and he's bending to the will of religious fanatics, when in fact people like me who are not at all religious, who don't believe in the ensoulment of the cell at conception, have moral qualms about this. There are very serious people, for religious or nonreligious reasons, who worry about unfettered science without moral lines. And for the argument to have been made by the Democrats -- for good political reason, it's a winning argument on their side; they won a lot of support; they made a lot of speeches at the Democratic convention in '04, [President Reagan's son] Ron Reagan and others -- [it's] somewhat dishonest. I mean, the whole thing about Alzheimer's being stymied because of stem cell research -- we all know that Alzheimer's is not something that stem cells will possibly ever affect. But as one NIH [National Institutes of Health] scientist actually admitted in public, people need a fairy tale, and that was a fairy tale. So it was a very useful argument by the Democrats, because it wins votes. And I think the president was reacting to the demonization of any position that would draw any line. So the lines became rather unyielding on both sides. ... Given the politicization of the issue, describe for me, if you would, your reaction in particular to what [2004 Democratic vice presidential nominee] John Edwards said in one speech that he gave in Iowa, about those suffering from spinal cord injuries -- [actor] Christopher Reeve in particular. Well, John Edwards made what may have been one of the single most scandalous, opportunistic political claims that I've ever heard in the '04 election. He said that if you elect [Mass. Sen.] John Kerry and him, that people like Christopher Reeve will walk again. That is unspeakably shameless. First of all, it gives hope to people without any basis at all. It politicizes it. It makes it a choice of one party over another. And I've always objected to the false hopes. I'm a physician. I'm not practicing, but I know enough to know how to read the literature. I also suffered a spinal cord injury when I was young, in medical school, when I was 22, so I know a lot about that particular difficulty, and I knew from the day I was injured in 1972 that I was never going to see a cure in my lifetime. The neurology of the spinal cord is so complicated and misunderstood -- [it's] not understood why there's no regeneration in the central nervous system -- that there was really no real hope of any cure. And in fact, the reason I'm particularly sensitive about this is when I was hospitalized and in recovery, I was in rooms with other kids who were also injured, who were not medical students and who didn't know any of this and were living for the cure and had sort of mortgaged their lives and their futures to the cure that was never going to come. I particularly remember one fellow patient saying to me, "I'm going to give a cure seven years, and [then] I'm going to kill myself," which has always stayed with me. I don't know what happened to him, but I hope he didn't. But I don't know. And I've always thought, when I counsel people who are injured, to say: "Look, [a] cure may happen, and if it does, nobody will be happier than you and me. But in the meantime, you've got a life ahead of you, and you ought to work on it." And to promise a cure if a political party is elected or stem cell research is liberalized is so untrue. It is so exploitative of people's desperate hopes -- particularly the families, the mothers and the fathers; it's young people who tend to get injured in the spinal cords -- that it's cruel. And it should never [have] been done, and I think it's a scandal that it happened. And I was, as you might have noticed, duly outraged. Describe, if you would, your own sense about where you've drawn the line with [regard to scientific research], in terms of ideally wanting to be able to walk again, yet not being willing to cross certain lines. Well, I've thought about this a lot. I do not come at this from the Catholic point of view. I'm Jewish, and the Jewish tradition is much more liberal, if you like, regarding the fetus and the embryo and abortion. It's not at all like the straight Catholic view or the Evangelical Protestant view. And so therefore, I would have drawn the line at using the discarded embryos from the fertility clinics -- if society is allowing that kind of procedure, the use of in vitro fertilization, and if it allows the production of excess embryos. Germany, for example, does not [allow the production of excess embryos]. Interesting that a country with its history would not allow the excess embryo production, but we do. Given that we have that and we know these embryos will be destroyed in time, then I think we're not really crossing any lines, particularly because these embryos are created originally with the intent of creating a child. They were not created for experimentation. And that's where I would draw the line. I also think the line [President Bush] drew is untenable. When his presidency is over, it will be reversed for sure, and it will reflect a certain consensus in society. But what I worry about is that the line will then be moved. There were certain senators who at the beginning agreed we would use IVF embryos but never clone embryos, never create human life. But Sen. [Orrin] Hatch [R-Utah] and others then moved over and supported research cloning, which was given a much more scientific and obscure term, somatic cell nuclear transfer, as a way to obscure what it actually is. It's, in essence, the proverbial slippery-slope argument for you? Well, that's not where I draw it, but I worry about the slippery slope because of the behavior of certain politicians. I thought we really ought to have a bright line at the creation of life because I think that is the fundamental crime: to create a human life solely for the purpose of destroying it for the benefit of others. From your point of view, Dr. Krauthammer, if we create cloning for research purposes, and it will lead to a cure for spinal cord injuries, that's where you would say, "I'd like to walk, but not at that price"? If that choice were presented in that draconian way, where you guaranteed me a cure and you guaranteed it would be a far more difficult proposition that is applied to me, the choice would be easy. I would say no, it's not worth it. Applied to [a] whole class of people who could be cured tomorrow, that would be very difficult, but I think I nonetheless would hold that line, because there is a brave new world on the other side of that line that is truly terrifying, where fetal parts -- you can imagine all kinds of monstrous creations from human embryos hung in freezers. You don't have to have a science fiction imagination. But if you're offering me a science fiction proposition of a cure on the other side of this transgression, then I counter with the science fiction nightmare of what else lies on the other side. If our science is so advanced that you're telling me that you can cure spinal cord injuries with the creation of new human embryos, then I can only imagine what other things you can do with these created human embryos. And at that point, since this is a hypothetical and it's happening [in] a very advanced future, I think I would be so terrified that I would have to say no. Show me what else you will create, and then tell me how that will be a benefit to humanity. And is that precisely why drawing lines is so important as technology becomes that much more advanced, that more and more we'll be faced with those sorts of possibilities? Of course. I mean, look, it's amazing to me that the left, which has been so powerful in arguing for the lifting of limits on human embryonic research, is the same political impulse that 60 years ago was the great pressure for restricting the other amazing scientific advance of our time, which was nuclear power, nuclear technology. It was essentially liberals -- there were, of course, others. But there were ["father of the atomic bomb" J. Robert] Oppenheimer and others who understood the power that modern science has unleashed has to be controlled. And yes, it might mean the restriction of certain human benefits. So why is it that the fashionable, liberal, progressive position is lifting restrictions with protean biological advances while [at] the same time insisting on limits on nuclear technology and excoriating the right or those on the other side who resist limits on these nuclear technologies? One of the paradoxes is that you get progressives protesting with great vigor a genetically engineered tomato while at the same time not only countenancing but encouraging experimentation with the human embryo. Explain to me how that works. What happened with the discovery of atomic power in the '40s, is it of the same scale [compared to] what is going on today? I think the potential for the alteration of human life -- nuclear has the potential [for] the extinction of human life, which you have to respect; that's a major thing -- ... the alteration of human nature, the alteration of our relation with society, the alteration of the family, the bonds between generations, the lines between species, all of these things we're at the threshold of, and anybody who doesn't have trepidation about this, to quote [stem cell researcher] James Thomson, has not thought about this seriously. If, to you, an embryo is not ensouled life, as you said, what is it exactly? Is it tissue that's deserving of special respect? Tell me what it is to you. ... To me it doesn't have the same status as a human baby, but it does not have the same status as an appendix. So the only answer one can give [is], it has some intermediate status. As it approaches the ninth month, it acquires more and more the status of a human being, so that if somebody were to destroy the fetus in the eighth month deliberately, in some states they're charged with murder, which says that we recognize even in a country with legalized abortion that this thing, as it progresses, actually achieves personhood, even before birth in some cases. At a very early stage, it is very much like a tissue, but the fact that it has the potential to become human, and if unmolested and implanted it will become human, it deserves a certain kind of respect. And you can almost argue negatively, woe to a society that does not show that respect because of what we discussed earlier, because of the protean possibilities of what can be done for good or for evil in the manipulation of the human embryo. I mean, imagine that human beings at this early stage in our moral development have stumbled upon these two great powers, one to produce human extinction and the other to actually alter human nature through the use of science. We're a very young species, and I'm not sure that we're old enough to handle either of them. Coming back to President Bush for a moment, although you disagree with the line he drew, is it your fundamental belief [that] what he deserves credit for is that he drew a line, that he put up a kind of stop sign? He did, and I think that was important in the history of the country and in the history of thinking about bioethics. Generally speaking, all of our commissions were driven by scientists. Very honorable people, but scientists are like carmakers: They have their own interests, like it or not. Their interest is to be unmolested in pursuing scientific truth. And why not? So they have an interest, conscious or unconscious, in being allowed to police themselves. ... But it takes a lot for a society to trust what is essentially a trade association -- a noble one, but a trade association -- to entirely police itself, especially in the face of the monstrous as well as the beneficial possibilities of the manipulation of the human embryo. I think it was important for a president to stand up and say there are other considerations. You may not agree with the ones I invoke, but you really ought to think about this. And again I quote James Thomson, the father of stem cell research, ... who said to The New York Times a few days after the announcement of the initial breakthrough with the production of stem cells without the use of embryos, who said, "Anybody who hasn't been troubled to some degree by human embryonic stem cell research hasn't thought it through," which I think is a very honest assessment. Now, he came to that realization, and he nonetheless conducted embryonic stem cell research. I give him all the credit in the world for having seriously thought about it, for having seriously considered it, and then to go ahead and do the research, but with a sense of trepidation, a sense of conscience. And I think what the president did, by drawing the line he did, is to say to the country, perhaps we ought to be drawing lines. And the fact that a few years later, we now have what seems to be a remarkable breakthrough by [James] Thomson and [Shinya] Yamanaka, of producing stem cells without using human embryos, could mean that we may in fact have finessed the issue and may not have to face it. But we're going to have other ... ethical dilemmas in the future. [They] may not have exactly this shape and form, but the issue will be the same: How far are you willing to go in the violation of the human organism? Whether experimenting on adults, whether embryonic stem cell research, whether tissue transplantation, there are all kind of considerations. How far are you willing to go in the blind pursuit of a, scientific knowledge, and b, human cures, given what might lie on the other side of that line? And for a president to have reminded us, in a very difficult situation where it was a political loser for him from day one, I think is a benefit, and I'm glad he did it. Thomson has also said, as you know, that the limitations placed on embryonic stem cell research were not helpful to his eventual breakthrough; that in fact it slowed him down. So why would the president deserve credit for something that he in fact made more difficult? He did that, and he produced, miraculously, mice stem cells without embryos. He then said, can I apply this to humans, never having gone through the embryonic human stage, because he didn't particularly want to. So he got to the great Holy Grail, if that's what it turns out to be, of producing stem cells without embryos entirely by not dealing with human embryos, [by] dealing in a mouse analogy, jumping from the mouse adult producing stem cells to the human adult cell producing stem cells, without a detour into human embryonic stem cells. There are those who argue that if we hadn't spent all these years on human embryonic stem cells and had concentrated on what Yamanaka did by using the mouse analogy, we might have arrived at all of this earlier. [Writer] Mike Kinsley, as you know, views this somewhat differently. His analogy was that if you put up a blockade on the beltway and somehow creative people found their way around that blockade, the people who put up the blockade don't get credit for the way around. So why should the president get credit for stopping things or slowing things down? Well, because he didn't put up a blockade. He put up a speed bump for people headed in a certain direction, which he was trying to discourage, and offering a lot of support and encouragement to alternate roads, which were illuminated, which would lead to getting a stem cell without human embryos. And sure enough, people went on that path because that's what the administration, among others, was encouraging. And that's where the science would lead you if you wanted to get around that speed bump, and that's how it was produced. ... I think the president will always be remembered for having raised the moral consciousness of a nation about the moral issues, and that's what his main contribution will be. But he's been attacked for, "Well, you did that, but you stopped the real research to help humans get a cure." Well, in fact, he didn't. It turns out that within six years, seven years, we now have a technique that, if it pans out, will give us not only stem cells in abundance but, as you know, will give them to us genetically identical to the patient so that we're not going to have any of the issues of rejection in tissue matching. So we have arrived at a much higher stage. And also, as you know, the technique that Thomson and Yamanaka have outlined is so elegant and so simple, if you compare it to somatic cell nuclear transfer, which is the equivalent of using embryos, the somatic cell nuclear transfer is infinitely more complicated, expensive. It requires invading women so they can produce a lot of eggs. I mean, the new technique avoids all of these dilemmas and difficulties. So the president, his intent was not to produce this great Holy Grail of producing stem cells. It was to raise moral issues about how they are produced. But, in fact and in effect, and empirically undeniable, is the fact that, within his seven years, partly as a result of the research he was encouraging and discouraging, we ended up with a new technique, which is infinitely superior to the old embryonic techniques. Yes. I don't disagree. I mean, I was for using discarded embryos from clinics long before Yamanaka and Thomson and long before the president's speech. So I've always supported that research. I would like to see that research, but if you remember, when it came to a vote some years ago, it was coupled with a provision that would outlaw the creation of new embryos for research, which is exactly where I wanted the line drawn. Over time, that coupling has disappeared, so I've been very concerned about that, because it talks about this erosion of lines that I'm always concerned about. But I have no problem whatsoever with the continuation of embryonic stem cell research using discarded embryos, and I think it will have to [be] in place in the short run until this other technique is proven. If [this new technique works], then I think embryonic stem cell research will probably be obsolete simply because it will be less efficient. And if you're a scientist, you'll want to go to the more efficient and also the more genetically identical treatment if you had to choose [between the] two techniques. But I would in no way support a ban today that I would not have supported in the past. So when you have written that the debate is over, that doesn't mean to you that the embryonic research should stop? ... I meant it in a generic sense, that once we get this [new stem cell technique] worked out, there will be no incentive. I don't pretend that there's no argument today. We still have a bill on whether the federal government should support embryonic stem cell research using discarded embryos. I've always supported that, and I've always written that that's where I would have drawn the line in allowing that. And if it doesn't pass under [the Bush] administration, it will. But in the end, this debate over the use of human embryos for stem cells is essentially over, because we have at hand a new technique that will make all the others obsolete. I think people who want to make a big issue about this are fighting a rearguard action. Some of them are scientists who want to do this work, but others of them are political opportunists who want to keep the issue alive because it feeds a certain trend in public opinion and it promotes their political fortunes. So I'm more interested in the scientists who want to do this. I have no problem with supporting it. ... You've written about your concerns about the commodification of the embryo. Can you talk about that? Well, if you have a lab that takes an egg and a sperm, puts them together and then ends up either selling it for scientific research or selling its products -- growing it for a while, either selling the stem cells or, who knows, you go out [for] a few months and you sell fetal organs -- that's not a world we want to live in. I think the beginning of respect for human beings is that they are not to be bought and sold, nor are their parts to be. Is the fundamental worry, then, that we just get numb to the subtleties, to the very moral questions before us? Once you begin to commodify something, you buy it and you sell it, you do lose sight of what you are transgressing. I assume that's what it was like in the height of the slave trade. People somehow blinded themselves to the fact [that it was wrong] because it was commerce. And because it was all done by accountants and on paper, they blinded themselves to what actually was going on. And this went on in very sophisticated and in very moral societies. American society in the 1700s produced the greatest documents about liberty in human history. Here was a society in which this was going on every day, so we know from our own imperfect history how easy it is for us to be numbed and to lose sight of humanity. It's infinitely easier to lose sight of humanity if it's a little embryonic ball of tissue. And to me, it's not a full human being, but it is more than a piece of appendix. And once you treat it like a piece of appendix, then you are headed in a direction where somebody will say: "Just let me grow it for two more weeks, and then for six more weeks. Think of all the good I can do, all the cures I can bring. Let me have a little beating heart that I can then extract, transplant into suffering children. Let me just have a bit of a brain that I can use." And perhaps that tissue will be useful in treating a neurologic disease. I can see how it becomes irresistible. And that's why I think at some point early on in this history, the same way that we did with atomic energy, you draw the line and say: "Yes, we understand. We may be forgoing some human benefits, but we are avoiding human tragedies and transgressions of a much larger order of magnitude." It's a trade-off. It's a difficult one, and I respect the arguments on all sides. But I hope the other side will show some respect for those who want to at least hold up the concern about crossing lines. Lastly, you've also written some recently about religion and politics, and I'm curious about how you see that with this issue, because, as I understand your view, it's perfectly fine for religion to infuse the way in which you view some of these questions. But you also have some feelings about our going too far with that. I don't care about how a person derives his moral opinions. I don't care if it's from an endless reading of [philosopher Immanuel] Kant. I don't care if it's from Scripture. I don't care if it's [writer] Christopher Hitchens on a bender working out his own moral system. [A person] comes to the political arena like anybody else and makes a claim, and it has to be respected. That's what a democratic society is, and his vote counts for one. People discount so many of the arguments of embryonic stem cell research because a lot of opposition comes from people who have a religious grounding in their view. I don't quite understand what makes that illegitimate. There's nothing in the Constitution that says that one cannot derive political opinions or views from an understanding of the transcendent. In fact, there's a lot of that in our Declaration of Independence. So I don't really care where the view is derived from. In my case, I'm not a religious person. I don't believe that ensoulment happens at conception. But like any sentient human being, I understand there is something quite mysterious about life itself. I mean, life and consciousness are the two great mysteries. Actually, their substrates are the inanimate. And how do you get from neurons shooting around in the brain to the thought that pops up in your head and mine? There's something deeply mysterious about that. And if you're not struck by the mystery, I think you haven't thought about it. There's something mysterious about how combinations of otherwise dead DNA, which are just a nucleic acid, somehow arrange themselves and produce living human organisms. That's the mystery that deserves respect. Whether the mysterious transition happens at the very beginning with the zygote or whether it happens more gradually, we know that it ends up with a baby in the end, which in itself is a wonder. So I respect that mystery, and I have less respect for those who think that this is all easily explained by material means. I'm not implying something transcendental, but there's something that we don't understand about how you can transition from the inanimate to the animate, and we see it happen before our eyes. So I think that you need an elementary respect for that. Whether it's religious or secular, I don't really care. So in a sense, that brings us back to the speed bump. I mean, because there's a mystery, we do well if we have a few speed bumps as we approach them? Speed bumps do at least make you think about what you're doing and think about what the consequences of unlimited speed, haste and willful pursuit of truth can do. We certainly have done that with nuclear power. Why we would not do that with the power to change human nature and the human organism itself is beyond me.